Currently viewing the tag: "thread repair"
Thread Inserts: HeliCoil or Time-Sert? I’ve never — knock on wood — had the “fun” of trying to repair stripped threads in a key mechanical component, but I’ve seen various options. It seems that the two main contenders for thread inserts are Heli-Coil® and TIME-SERT®, but I don’t know which one works better for which applications and materials. TIME-SERT® requires drilling, counterboring, and tapping before installing the insert. A typical TIME-SERT kit, with all the required tools and several inserts, costs around $74. Heli-Coil preparation needs drilling and tapping before installing the insert. 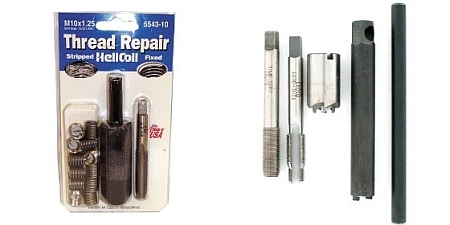 A Heli-Coil kit, with a tap, the installation tool, and several inserts, will be about $27. So, all you Toolmongers out there with experience in this area, what’s your favorite? Are there alternatives?